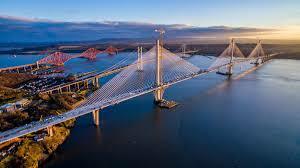 I had the pleasure of going over the New Queensferry Crossing this week. Despite the speed restrictions still in place, it was an amazing journey going over this bridge looking over the left and viewing the Forth Road Bridge and Rail Bridge. Who could fail to be impressed! If you were caught up in traffic spare a thought for those of us that used to have to go by ferry from just below the Rail bridge!